i b i k e l o n d o n: What next for London's Cycle Superhighways? What next for London's Cycle Superhighways? The official consultation on the Mayor of London's ambition to build two new separated Cycle Superhighways across the city has come to an end, but those who are against the plans are still making their case strongly behind closed doors. Transport for London received over 20,000 consultation responses, one of their highest response rates ever. Of those, approximately 80% are said to be in favour. Transport commissioner Sir Peter Hendy has hinted that TfL will listen to all concerns raised, and will publish revisions to their designs in approximately two months "that will work for everybody." 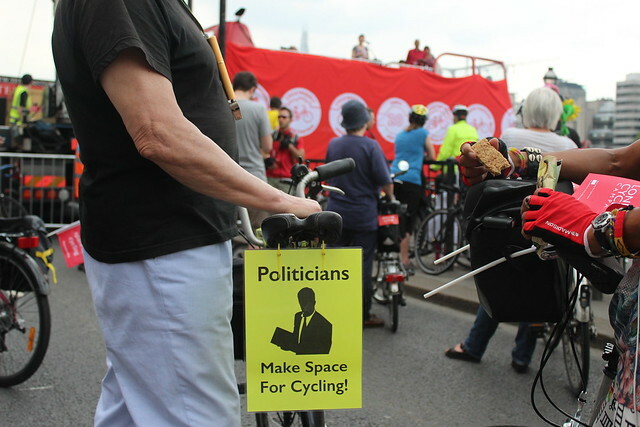 Cyclists make their concerns known in May's Space4Cycling protest. 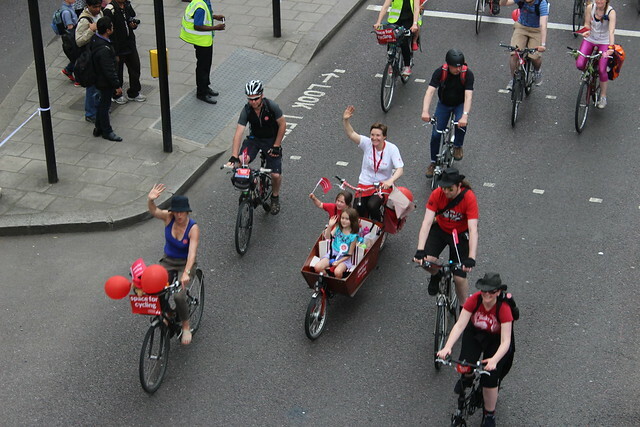 When the consultation closed at the weekend over 160 city businesses, institutes and organisations had written to Transport for London expressing their support for the Cycle Superhighway plans. Support has continued to roll in past the deadline, including that of publishing group Pearson who employ over 4,000 staff, many of who cycle in London. Whilst London Assembly member Kit Malthouse was busy last week telling the Mayor his constituents were desperate for the Cycle Superhighways to be extended through his borough, opposing forces were working to undermine the plans. The London Chamber of Commerce and Industry has proposed that the cycle tracks should be narrowed and only 'partially segregated' from traffic, allowing other road users to utilise the same space as cyclists. A similar system operates for the existing Cycle Superhighways which have seen an increase in cycling numbers but have been roundly criticised by campaigners following a series of deaths on the routes. Cyclists take over part of the proposed route of the east / west Cycle Superhighway. All this is set against the backdrop of more consultations on further significant changes planned for London's road network; on revisions to Cycle Superhighway route 5 through Oval and Vauxhall, at Archway Gyratory, at Stockwell Cross, and plans to remove the Old Street roundabout. Those who were around for the Battle of Blackfriars just a few short years ago will remember how cyclists had to fight and fight just to stop cycle lanes being ripped out in order to "maintain traffic flow". It would seem that some elements of Transport for London have come a very, very long way since then. But when it comes to winning over the rest of London - most especially its most influential interests - we can't afford to rest easily just yet. Watch this space. Think tank the Centre For London are hosting a debate on the 10th December; "Are Cycle Superhighways good for London?". The Mayor's Cycling Commissioner Andrew Gilligan, CyclingWorksLondon's Chris Kenyon and Canary Wharf Group's Howard Dawber will all be there. Register to attend here. The superhighway is a great idea. London is an ideal city to cycle round and so many of us want to do it in safety. bring it on.